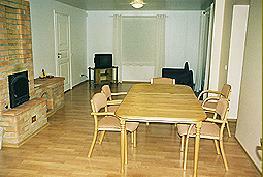 There are two rooms, sauna and skiing room on first floor. Room number 1: with two rooms (one living room and one bedroom); one king-size bed and one sofa; TV set; mini-kitchen; water boil and coffee automat, fireplace; washing possibility in sauna (one hour in sauna is included). 4 places; possible to add two camp beds. 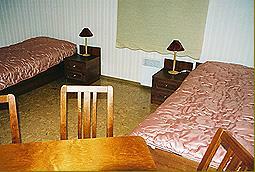 Room number 2: with one room; two beds; TV set; washing possibility in sauna. 2 places; possible to add two camp beds. Sauna: with electrical oven; whirlpool; two showers and dressing room. Ski-room: there are possible to maintain your skis.